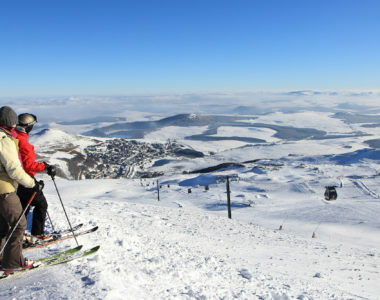 Super Besse is located at the foot of Puy de Sancy. Summer and winter is an active holiday, in the countryside and for the whole family. Where will you start? You want to enjoy quality time with your family? It is not that simple to organize your holiday in a family where everyone has got a different definition of holiday. Super Besse will achieve unanimity. With all its activities and hobbies, the hardest thing to do is choose. In summer, Super Besse is a real open sky leisure park: nautical base, marked hiking paths, swimming pools, summer sledge, grass glides, mountain bikes, adventure routes… There is one for everyone’s taste and age. And why don’t you fly like a bird and skim the Hermines Lake with a giant zipline? 1600 meters long (5249 ft.) to admire the landscape! Around the Hermine lake, you can enjoy nautical activities but in a mountain environment. With an adapted grass beach and supervised bathing, you will feel like you are near seaside! Inflatable structures are disposed in the “aqualudique” space and are making a real adventure path on the water, that you can try to achieve whatever how old you are. You could also enjoy activities such as paddle boat, kayaking, sailing dinghy and paddle. Le Puy de la Perdix (1854 m / 6083 ft.) overhangs Super Besse resort. It will give you a wonderful 360° view over the Chaudefour valley. A pedestrian path allows you to join the summit in a two hour walk, return trip. The Perdrix cable car starts from 1320 meters (4331 ft.) to 1800 meters (5905 ft.). In summertime, it allows a simple access to the Puy de Sancy’s summit, then a 40 minutes walk on fairly flat terrain. At the arrival on site, you will have a wonderful view on the Nature Reserve of Chaudefour’s Valley. Open your eyes, Dall’s sheep love these volcanic peaks. Rather downhill mountain bike or hiking mountain bike? Why not both! 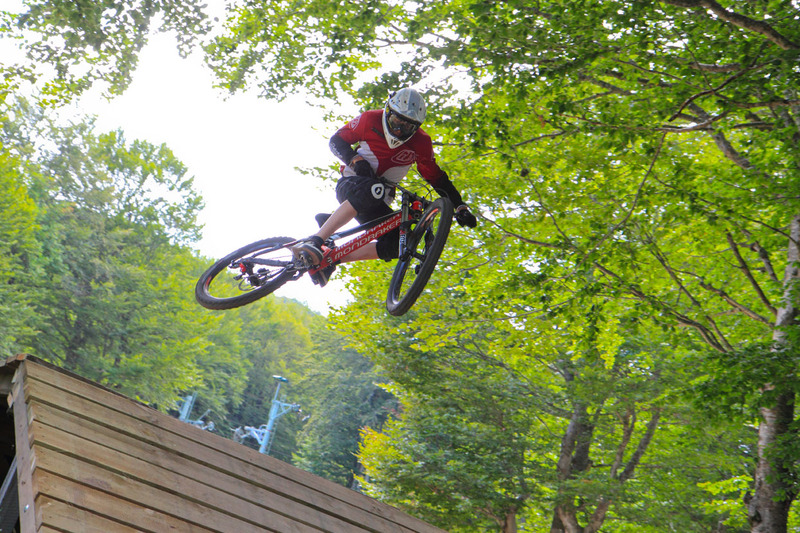 The cable car “La Perdrix” has allowed the Super Besse resort to develop a great zone Super Besse Mountain Bike where you can practice downhill mountain bike in a funny and educational way. Several zones has been created: bike Park with units, jumps and footbridges, downhills trail with 6 slopes accessible from the Perdrix summit , Kid Zone for mini bikers and for the learning process of the discipline with units at children scale with slaloms, small humps and footbridges. Numerous mountain bike cross-country routes can make you discover a various number of landscapes around Super Besse. In winter, Super Besse ski resort offers quasi every ski and glide pleasure. Alpine ski, cross-country ski, snowshoe hiking, fantasy sledge, snow scoot, yooner, speed skiing… And many more to discover the glide pleasure. On the discovering area beginners, no matter how old they are, can make their first mark on snow. For those who know how to ski, the link with Le Mont-Dore resort opens new slopes on the north side. During nighttime, 13 slopes are lighting up to taste the particular atmosphere of night skiing.